The Rafu Shimpo and Japanese American Living Legacy, an established nonprofit dedicated to preserving Japanese American history through oral histories, announce the publication of “Proud to Serve,” the first comprehensive listing of Nikkei World War II veterans that also includes narratives covering major battle campaigns, personal stories, historical photos, and other features, many never before published. It will also serve as The Rafu Shimpo’s first book. In 2010, President Barack Obama signed Public Law 111-254, awarding the Congressional Gold Medal to the 100th Infantry Battalion, 442nd Regimental Combat Team, and the Military Intelligence Service (MIS). Congress officially recognized these three distinguished units of World War II in an inaugural ceremony on Nov. 2, 2011 in Washington D.C. Since that event, Nikkei enclaves across the U.S. have conducted smaller-scale regional ceremonies that recognize veterans in more “local” settings; many of the community’s veterans could not travel to Washington for the original ceremony. “‘Proud to Serve’ is a permanent keepsake for generations to come and a tribute to the heroism and sacrifices made by the Japanese American veterans of World War II,” said Chris Komai, editor of the publication. “Proud to Serve” uses data from the Echoes of Silence Project created and maintained by the Americans of Japanese Ancestry World War II Memorial Alliance. Educational Project Manager Jim Yamashita has been leading his all-volunteer team of since its inception in the early 1990s. 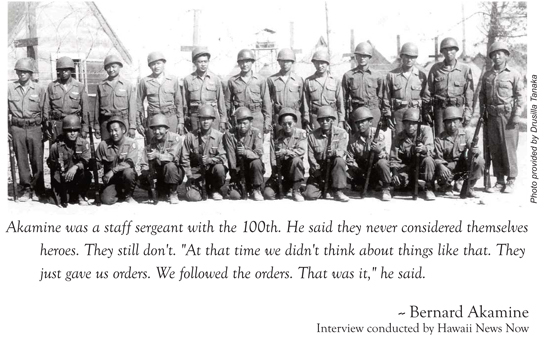 Echoes of Silence tracks all of the World War II Nisei veterans and their Caucasian officers with a special emphasis on the KIA (killed-in-action) soldiers. In conjunction with the commemoration ceremonies, The Rafu Shimpo plans to publish a special edition that covers the current ceremonies as well as provides historical reprints of news and photographs from The Rafu’s archives. The special edition will run in a color newspaper format and will be sold for a nominal price; Rafu subscribers will receive the special edition at no additional cost. The organizations will be selling “Proud to Serve” at an introductory price of $24.95. After Memorial Day, the retail price will be $29.95. All pre-ordered books will be delivered after Memorial Day. Wholesale pricing and bulk orders are available to other nonprofit organizations and retail outlets; these orders should be arranged directly with the Rafu Shimpo. Call (213) 629-2231 for details or fill out the ORDER FORM and send to: The Rafu Shimpo- 701 East Third Street, Suite 130, Los Angeles, CA 90013-1789. 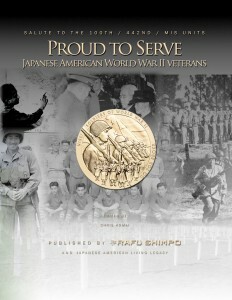 Online ordering is available at www.jalivinglegacy.org (under Nikkei Writers Guild). Japanese American Living Legacy is a California nonprofit (501.c.3). All of the board members, staff and advisors are volunteers. For more information on Japanese American Living Legacy/Nikkei Writers Guild, visit www.jalivinglegacy.org or call (657) 515-5501. The Rafu Shimpo is the oldest and largest daily Nikkei publication. It has served both the Japanese and Japanese American community since 1903. For more information on the newspaper or how you can subscribe, visit www.rafu.com or call (213) 629-2231. I have 5 “Proud to Serve” books on order and paid for. When will you be shipping my five books? Or has there been a delay in the expected date of publication? I have a question regarding requesting the complementary copy from a Copper Sponsorship level donation; who do I send my mailing address to? I got my books and they look great. Mahalo!